This species has a very large range throughout the entire Mississippi River drainage into the Gulf of Mexico and Great Lakes and St. Lawrence River system. It is secure throughout its range. 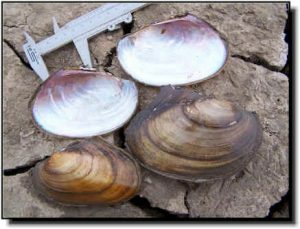 Comments: The fragile papershell is a thin-shelled mussel that is consistently yellowish-tan in color. It can be considered a pioneer species, as it is often the first one to reinvade an area after a drought or flood deposition. It is often found deeply buried in the substrate with its foot extended to help anchor it. 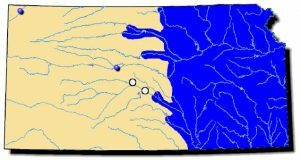 It could be considered a habitat generalist because it can be found in rivers, reservoirs and many smaller creeks with permanent pools. It is typically one of the mussels species found where only a few species are represented. It can be mistaken for the pink papershell, but the fragile papershell is less rounded along the ventral margin and usually a lighter color in comparison. © 2017 GPNC. All Rights Reserved.